The gate of the Caf is still down at 10 on Sunday morning, but Willie Butler saunters out to chat with the students who are congregating for his famous weekend pancake brunch. It’s the last brunch of the semester—the day before finals—and Willie has promised epic pancakes. If students don’t line up early, they’ll be waiting a long time. 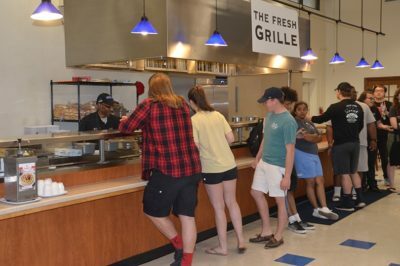 The previous week, the line didn’t let up until 1:15 p.m.—15 minutes before the Caf closed. Worse than the line, perhaps, if students wait to show up, they might miss out on specialty pancakes. Five years ago, Willie was promoted to dining room supervisor for one weekend. His boss received so many emails by the start of the week from students wanting Willie back as chef, he struck a deal—keep the pay but return to cooking for students, he says. Willie spent 13 years in the Army, stationed in Germany as a tank driver, working with explosives and ammunition. Cooking was a hobby after growing up with 14 sisters in Michigan. “I grew up in a house full of women, so what else is there to do?” he jokes. “I learned everything from them.” Now, he and a nephew are the family cooks at holidays while the women “watch the kids and watch the sports,” he says, laughing. He estimates he has 40 to 50 nieces; the family is spread from Oklahoma to Texas, Michigan to North Carolina. 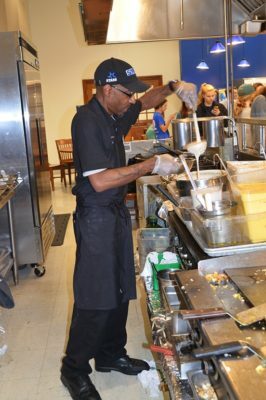 When Willie started at OKCU, students did not love the Caf’s standard breakfast recipes, he says. Every half hour, the dishwasher retrieves Willie’s pile of mixing bowls. White plates tower behind the cooktop by the French toast mix, and Willie estimates he goes through 200 during brunch. “Talk to me, young man,” he tells a student in line. Willie keeps the line rolling, the pancakes flipping, and the students happy. His favorite part of the job is cooking for Gamma Phi Beta’s Pancake Palooza fundraiser every spring. In fact, Willie cooks for many who ask: sororities, fraternities, the Broadway Bound dance camp, and Methodist summer camps. He chips in ingredients and gets Walmart to donate, too, when students are raising money for a cause. “I enjoy everybody—that’s what makes this fun. I’m here for them.” He likes how everybody feels like family at OKCU “from the president on down.” He gets to know students starting in high school when they attend camps. He knew one student from her high school freshman year through her college senior year, and he’s friends with her parents on Facebook.